I LOVE a good pamper night in. There's nothing better than a bit of 'me' time after a long hard day/week. Treating yourself to some of those treatments and goodies can make you feel revived and put that smile back on your face! BUT these things don't have to be expensive and I am forever buying cheap little pick me ups to help myself, hair and skin to feel it's best even if I am half asleep! So....... 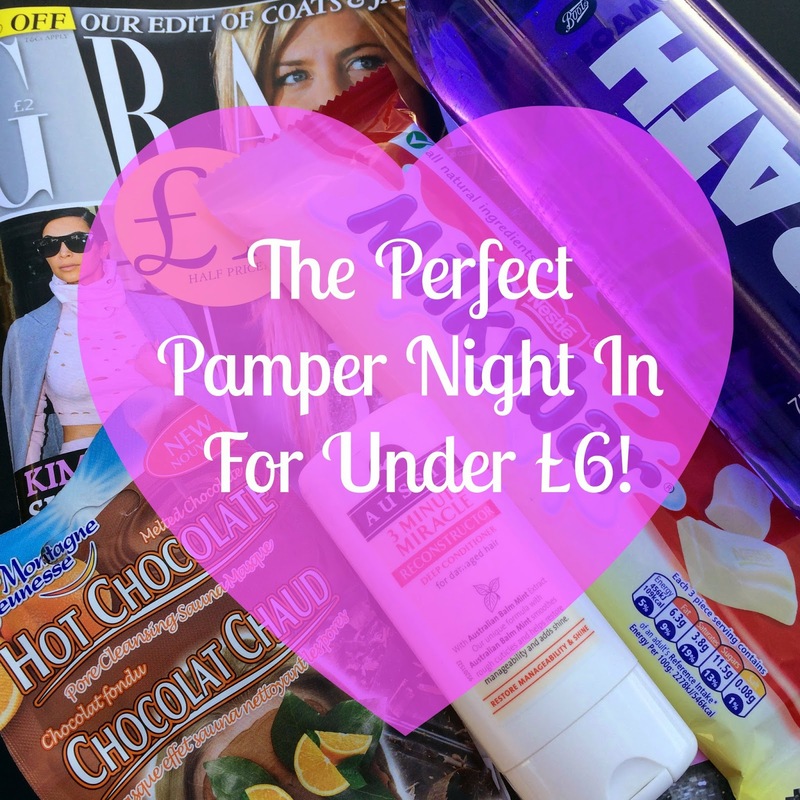 I thought I would share with you lovely ladies 5 great products to complete the perfect girly night in and guess what - the total only comes to £5.58!! That's surely only a couple of drinks in Starbucks or a Subway right - totally worth it?! Guess what...this weeks Grazia mag is just £1! There's nothing better than chilling at home with your feet up, cup of tea (or wine) in hand, reading through the latest celeb gossip, fashion must-haves and beauty secrets! Plus it's got Jen An on the front aswell - always a winner! These masks are some of the best value for money beauty products out there! I buy them constantly and if you read A Yellow Brick Blog alot you've probably noticed! This hot chocolate mask is a fabulous self heating detoxing mask which smells amazing and always leaves my skin feeling smooth and refreshed! To read more about it check out my previous review - here. A night in isn't complete without some chocolate to crush that sugar craving - every girls best friend in a bar. Bath's are something that I have rarely, I'm more of a shower girl myself but once in a while I like to have a good old soak! This bubble bath is infused with lavender to help you relax and unwind, perfect for after a long week at work for me! This bottle is huge so it will last me ages and for just 89p it is a must buy! TOP TIP : IF you have short hair you can buy the sachet of this product for only £1.09 (another 60p saving, making it less than £5! ), but my hair is too long for just one sachet now so I thought this mini bottle would work better! Hair masks are my favourite thing, I love giving my dry, drab hair a lift with one of these and Aussie smells the best! I like to leave these on for at least 10 minutes and then let me hair air dry for a soft, long locks! Bargains! Absolutely love the aussie hair treatment it's a must for a pamper night. I love cheap bubble bath too means you can have lots and lots of bubbles!! Hot Chocolate Face Mask. Eurghhh gimmeeee! That sounds amazing! Totally craving milky bar chocolate right now! Such a good post. Really want a milky bar now though!